Looking for tires near you in Fort Gordon? Firestone Complete Auto Care can get you back on the road with the best tire brands. Visit our shop to find your tires today! 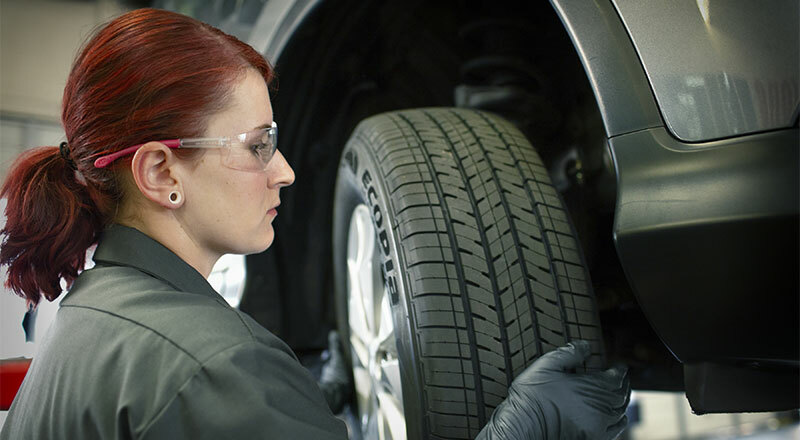 When you need new tires in Fort Gordon, you need Firestone Complete Auto Care. It doesn't matter whether you drive sports car or a family-friendly minivan, you'll find tires for less! We'll help you settle on the best tires for your driving style, climate, and vehicle. Explore our wide catalog online and shop tires from world-renowned brands like Firestone and Bridgestone. Then visit your nearest shop for best-in-class tire installation. From run flat tires to eco-friendly tires, Firestone Complete Auto Care has what your vehicle needs. Not sure if you really need new tires? We've got knowledgeable technicians ready to help, but you can do a quick inspection in your driveway too. First, examine your tread wear. If the tread looks slick and shallow, your tires may not have enough grip to keep your vehicle on the road. That's a safety issue! Keep an eye out for bumps, bulges, tears, or sidewall cracks, and figure out how old your tires are. Aside from your tread condition, car manufacturers usually recommend getting new tires every six to ten years. Your safety on the road can depend on it, a main priority for us at Firestone Complete Auto Care in Fort Gordon. Take on Route 66 or invest in better gas mileage with the right tires your favorite tire place, Firestone Complete Auto Care. We'll hook you up with the size you need from the most trusted brands, including Firestone, Bridgestone, and Primewell. Put your confidence in us and you'll get more than professional recommendations and tire installation. We'll also give you courtesy pressure checks and tread inspections, as well as fast flat tire repair, alignment, and rotations. We've been a place for tires in Fort Gordon for many years, and a leading tire provider in this country for almost a century. For quality service at spectacular prices, come to Firestone Complete Auto Care. Find your nearest location and schedule a tire installation appointment today! From transmission work to batteries to headlight replacements, head to a Firestone Complete Auto Care near you for your car repair and maintenance services. We're your all-in-one tire store, car care center, and automotive shop. Our skilled technicians believe in truly complete auto care. When you bring your car or truck to us for maintenance, we will strive to make your visit satisfying. Explore our services and at your convenience, schedule your next courtesy check or repair in Fort Gordon, Georgia today.